Do you really need a pantry full of potentially toxic cleaning chemicals? Or can temperature, in the form of boiling water or ice -- together with that wonder duo, baking soda and vinegar -- clean most everything? We put several temperature-based house cleaning methods to the test. Some of these are widespread urban legends. Others come from an exhaustive list of alternative cleaning methods compiled (but not tested) by the Solid Waste Agency of Northern Cook County, Illinois. Here is our verdict on 8 boiling and freezing cleaners, with 4 extra tips thrown in for good measure. To clean off microwave grime, we tried boiling 4 tablespoons of lemon juice in a cup of water for 5 minutes. We used a wide bowl to allow lots of steam to condense on the microwave. After carefully taking out the bowl, we easily wiped away splattered stains that typically require some elbow grease, a scrubbing sponge and all-purpose cleaner. SAFETY TIP: To prevent superheating, insert a toothpick or wooden skewer in water before microwaving it. On a related note, we recommend sterilizing wet kitchen sponges regularly in the microwave. Researchers at the University of Florida found that two minutes in the microwave can kill most bacteria and viruses on sponges. However, for safety, be sure the sponge is very wet and contains no metal. Also, take care when removing the hot sponge after sterilizing. Last year, I had a particularly nasty clog in a bathroom sink. My first line of attack was a pot of boiling water. It did nothing but, to be fair, drain chemicals and a hand auger also failed. I had to call in a local plumber. Since then, I have poured a monthly pot of boiling water down each drain to keep it clear. So far so good, but it’s hard to definitively say the boiling water is helping. Some, including my plumber, recommend just using boiling water. Others say it should be followed by salt or sodium carbonate. Still others swear by a more complicated tincture: Thoroughly mix 1 part cream of tartar with four parts salt and four parts baking soda. Pour ¼ cup of the solution down the drain, then add 1 cup of boiling water. Watch it bubble, then flush with cold water. For a slow or blocked drain, try pouring in one cup of salt and one cup of baking soda, then flush with a pot of boiling water. We mixed 2 tablespoons baking soda with ½ cup vinegar in a non-stick frying pan with stubborn stains and burn marks, then giggled as we watched it fizz. We added a cup of water and boiled the mixture for 10 minutes. The pan was still stained at the end of the test, but the range was dirtier. Cover the pot to avoid splattering little white spots all over the stovetop. To be fair, this mixture may work on other stains, but it didn’t take care of the black spots on our pan. 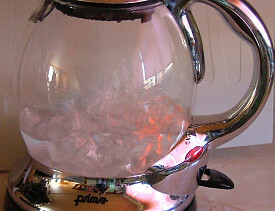 To remove calcium and lime deposits from coffeepots, kettles, etc., boil equal parts water and vinegar, then let it work overnight. Rinse thoroughly and the item should look like new. This has long worked perfectly on our electric kettle. We were told boiling socks in lemon water could make them bright white again. Not so much. My baby boy’s socks have dulled and “grayed” over months of washing in mixed-color loads and gentle baby-safe laundry detergent. Even after a lemony boil, they were still distinctly more gray than his new bright white socks. To be sure, I did not test really grimy socks, and I’m guessing some dirt can be boiled out of clothing. We also tried boiling a slightly yellowed cotton onesie in a pot with three parts water and one part cream of tartar. The onesie came out the same color but coated with gritty cream of tartar. Boiling water can help clean up outdoors as well. We poured boiling water on a weed-infested concrete seam between the driveway and the sidewalk. The weeds quickly shriveled and wilted, and pulled out easier than adjacent weeds that hadn’t been boiled to death. On the other hand, boiling water to pour on each weedy spot seems like an impractical and energy-intensive alternative to hand-pulling and spraying with cheap white vinegar, which I have found quite effective so far. We tried clearing the air by boiling a pot of DIY potpourri — a mix of citrus peels and sweet spices — to pleasant success. We have no way of scientifically measuring the odor, but it neutralized the stinky diapers. It also beats chemical air fresheners that often contain petrochemicals and carcinogens. To clean and de-stink the garbage disposal, we made vinegar ice cubes and crushed them in the disposal. They should also sharpen the blades. Just don’t drop those vinegar cubes in your ice water. It seemed to neutralize the smell but, again, we don’t have a smell-o-meter. Still, I think we’ll stick to our standard practice of grinding occasional lemon peels for smells and eggshells to sharpen. We came across a couple of other ways to use boiling water for cleaning, but weren’t able to test them. 9. Boil silverware: We hear boiling water and baking soda can clean tarnished silver, but we didn’t have any silverware on hand to test the idea. Here’s the method, according to the Cook County folks: Line an aluminum or enameled pan with aluminum foil, add silverware and fill with enough water to cover the utensils. Add one teaspoon salt, one teaspoon baking soda and boil for three minutes. An alternative method is to line a non-metal container with aluminum foil, sprinkle with four tablespoons baking soda, and add tarnished silver. Then carefully pour in a gallon of boiling water and wait two minutes. Either way, carefully pull out each utensil with tongs and wipe away the tarnish, then wash with soap and dry. 10. Exterminate ants: Boiling water is an effective, if perhaps cruel, way to get rid of fire ant hills. Thankfully, we have no ants to ward off, so we couldn’t test this attack. There are also a couple other proven freeze-cleaning methods, which we thankfully didn’t need to put to the test. 11. Remove gum: Remove gum stuck to clothes or hair by putting ice on the spot or freezing the clothing, then use a butter knife to pop off the frozen gum. 12. Kill bedbugs: Freezing is also one of the only proven ways (the other is heat) to kill bedbugs. Freeze infested sheets, backpacks or other items to 23 degrees Fahrenheit or less for at least five days, according to researchers at the University of Minnesota.